Mitsubishi Electric 2.5kW Split System is the PERFECT size for the average bedroom. We can supply & install for an upfront cost of $1,540.00 but after $400 worth of cashbacks it brings it down to an amazing $1,140.00! Contact us today before the rebates run out! How do the rebates work? If you purchase a peaksmart eligible air-conditioner you have the choice to have a signal receiver installed and you will be rewarded with up to $400 cashback! The amount of your cashback will be determined by the size of your air-conditioner. To help Queensland become a more energy efficient state the QLD government has committed $20 million for rebates on the installation of energy efficient air conditioners under their Affordable Energy Plan. This means that if you purchase a four star rated air-conditioner you will receive a rebate of $300. Very happy with the service from Dan and his team to install our air con. They were clean, tidy and efficient. He even collected our (separately purchased) air con units from the warehouse for us. Are you looking for air conditioning installation on the Sunshine Coast? 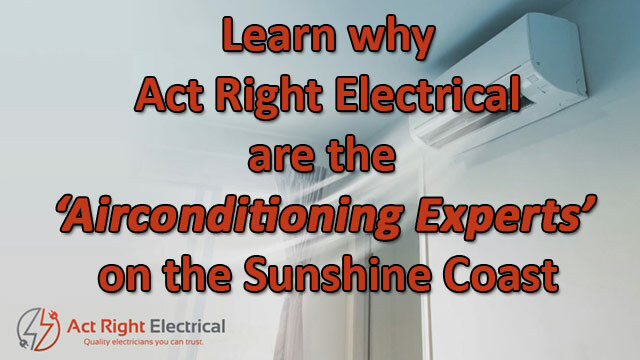 Act Right Electrical specialises in Sunshine Coast air conditioning installation, as well as air con replacement and removal. With over 20 years combined experience and dozens of rave reviews, we are fast becoming the air conditioning leaders in the Sunshine Coast. Once upon a time, buying air conditioners was considered a luxury. Now, thankfully for our comfort, it is considered a necessity in our hot climate. Along with the changing times, changes when it comes to the affordability and range of air conditioning units has also come to pass. Regardless of whether you regard your air conditioner as a necessity or a luxury it is important to understand your unit or the unit you are preparing to have installed. Knowing your system and choosing the right one for your home and required uses can save many costly mistakes. This is why Act Right Electrical are experts in the field of Air Conditioning repair and installation. We know our Air Cons! Be it for your home, a renovation home, rental property or hotel situation, Act Right Electrical have the knowledge base, the skills and the care factor to help you make the Sunshine Coast Air Conditioning choice right for your needs. We proudly service Sunshine Coast, Caloundra, Buderim, Nambour, Noosa, Coolum, Maroochydore and other areas. The average household energy bill, since privatisation, continues to grow. An air conditioner can chew into a large chunk of your energy expenses. Therefore it is important to ask Act Right Electrical for their expert advice. We can advise you on choices that will run your system without eroding your bank account. With so many options available, from window units to free standing combination heating and cooling units, which ones best suit your home or business? Which choice will work for you? We offer our knowledge and experience to help you make the most energy efficient solutions suited to your home, office or renovation home. If you have an existing air conditioner system, call us now to examine the efficiency of your system and help save you money. We know and understand that so much of a successful efficient ducted air conditioning install starts with the duct work. With our high standards we can save you a great deal of money by examining, servicing or replacing inside and outside coils to maximise efficiency and reliability. We understand how important the right air conditioning system is for your home and can ensure that the wrong choice, which can cause excessive operating costs, is not one of the problems you will have to consider. So for air conditioning services on the Sunshine Coast call Act Right Electrical on 0431 588 808, for all your Air Conditioner requirements – be it advice, installation or repair. Our team will offer professional, knowledgeable support with friendly, cost effective efficiency. 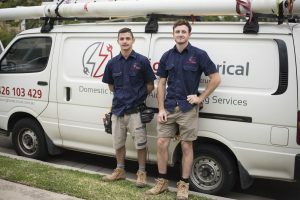 As licensed professionals, Act Right Electrical, Sunshine Coast, will provide your family or business with the best, most effective product for you. Contact us today for a free quote and honest advice. Call us on 0431 588 808 today for all your air conditioning Sunshine Coast inquiries, including installation. We guarantee that you will always speak to an experienced tradesman – no receptionists or ‘call back’ services.